The beloved animation classic by legendary Studio Ghibli director Hayao Miyazaki, My Neighbor Totoro is now retold in novel form. 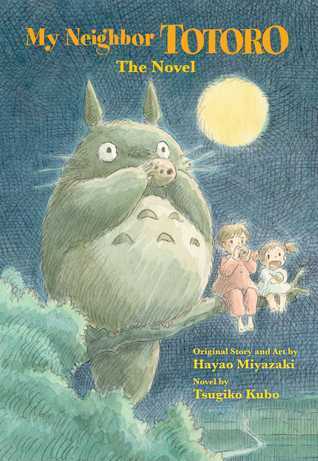 This prestige, hardcover edition features original illustrations by Miyazaki himself, accompanying a story written by veteran children’s book author Tsugiko Kubo. Sure to delight both existing fans and new readers! Eleven-year-old Satsuki and her sassy little sister Mei have moved to the country to be closer to their ailing mother. While their father is working, the girls explore their sprawling old house and the forest and fields that surround it. Soon, Satsuki and Mei discover Totoro, a magical forest spirit who takes them on fantastic adventures through the trees and the clouds–and teaches them a lesson about trusting one another. I can’t even begin to tell you how lovely this book was. I found it so comforting! I started watching Studio Ghibli movies a few years ago, and they really hold a special place in my heart. I’ve come to love the franchise, and when I saw this book I knew I’d want to pick it up. I wasn’t wrong in adding it to my TBR, I got through it in just a day and I adored it! If you’re a fan of the movie like I am, this book is definitely worth the read. Told mostly from the view of 11 year old Satsuki, it explores the challenges of moving to a new house and having an ill family member. It’s lighthearted and extremely gentle, but still nostalgic of the more emotional undertones of the beautiful movie. This book is extremely cute as a physical item, and is scattered with beautiful watercolour illustrations that are reminiscent of the animation. The story reminded me of Enid Blyton, who I adored as a kid! It really made me think how much I would have loved this book if I’d had it read to me as a child. I read this in bed, with fairy lights on, while I wasn’t feeling well one rainy day. The countryside setting is described beautifully, and overall the narrative is sweet and calming. If you like the movie/Studio Ghibli in general, this book is definitely worth the read. Ah you’d definitely love this book then!